LOS ANGELES—The Bhaktivedanta Book Trust is proud to announce the completion of a major new publication: Sri Caitanya-caritamrta, the jewel of medieval Indian literature. This devotional classic presents the life and teachings of Sri Caitanya Mahaprabhu, who initiated the Hare Krishna movement some 500 years ago. 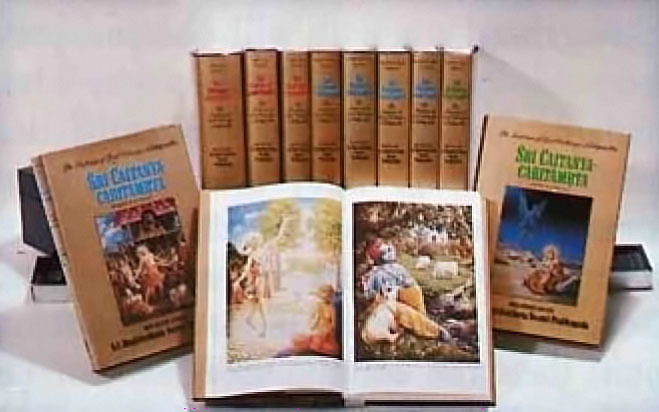 Originally written in Bengali by Krishnadasa Kaviraja Gosvami, who completed it in 1616, it has now been rendered into English by His Divine Grace A.C. Bhaktivedanta Swami Prabhupada in seventeen volumes containing about 7500 pages. The massive work features the original Bengali script, phonetic transliterations of each verse, word-for-word definitions, precise translations, purports, a variety of indexes, and 255 full-color illustrations. The translating and writing of commentary for this work took His Divine Grace only eighteen months, and the last thirteen volumes of the set were prepared for printing by the BBT staff in less than two months—all with no loss of the BBT’s standard of high quality printing and illustration. NEW YORK—Krishna conscious art made an impact in a recent competition here. 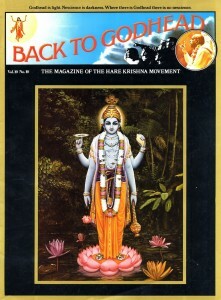 The American Institute of Graphic Arts awarded a Certificate of Excellence to BACK TO GODHEAD magazine for the cover of issue No. 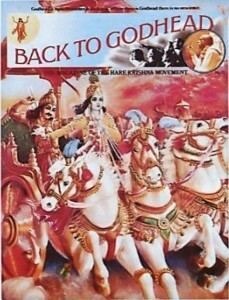 57, which featured a painting by Baradraja dasa of Lord Krishna and Arjuna on a chariot riding into battle. The cover was one of 135 book, record album, promotional and magazine covers selected out of 2400 entries. It is being displayed in AIGA’s “Cover ’75 / Catch the Eye” exhibition, which is touring the United States and Canada.